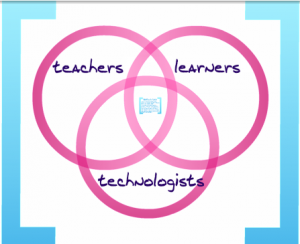 In the public school system, many argue there's a disconnect between teachers, students, and technologists. Educators and students don't have enough tech training, and those who create the technology to be used in schools don't work closely enough with teachers and students. To close the loop, a newly launched program in Baltimore will bring together a network of students, technologists, and educators linking teacher professional development to student after-school programming. Through Digital Harbor Foundation's EdTech Link program, teachers will be trained by volunteer technologists, then teach their new skills to students in after-school programs. Continuing the cycle of learner-as-teacher, students who attend the after-school program will, in turn, take their own training to educators in other schools. And volunteer technologists will get to experiment with new ideas directly by working with their users. It's a model that Andrew Coy, co-director of the new foundation, has been piloting at Digital Harbor High School in inner-city Baltimore. Once a week after school for the past year, Coy, who's a ninth-grade technology teacher, has been taking four of his high school students to nearby Liberty Elementary School, where the students coach teachers on how to implement their one-to-one iPad program. "We want to connect students to a vision of themselves as technologists, and pull them into that trajectory." 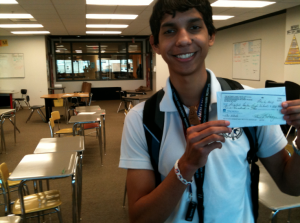 Student Jean Cedre holds his first check from a paying web client. with these great kids and develop relationships with them. It's just a much more comfortable way to get professional development." Students have also helped with everything from I.T. support for the high school's annual scholarship fundraiser to the creation and deployment of Web sites for non-profits and startup businesses. With the EdTech Link program, students and teachers will learn everything from learning how to code to understanding the premise behind 3-D printing. And they'll participate in Startup Weekend-type events, where students conceptualize and create apps and software for classrooms with help and guidance from local programmers from local tech companies. Organizers believe the program has potential to be a national model, with partnerships with community businesses fueling and funding the effort. Part of the plan is to re-purpose former recreation centers, underused library spaces, and other public spaces into non-profit community tech centers directed and developed by teacher fellows in the EdTech Link program. The first step in the process is for teachers to apply to the Digital Harbor Foundation's $5,000 fellowship to 20 educators, which includes a trip to the ISTE conference in June, where they'll begin their technology immersion. The rest of the summer will be spent prepping teachers to become tech trainers during the school year. Teachers will receive $500 per month to run the after-school programs. "We want to demystify technology for those who are scared because they haven't taken it apart," Coy said. And for students, the program is meant to "connect them to a vision of themselves as technologists, and pull them into that trajectory." Check out the Prezi explaining the program.